Oddball Stocks: How about those Japanese net-net's? I'm in California on vacation, and since I'm physically as close as I've ever been to Japan it seems appropriate to do a post looking back on the Japanese net-net's I've profiled and mentioned on the blog. I put together a spreadsheet showing the performance of all of the Japanese stocks mentioned on this blog over the past year. 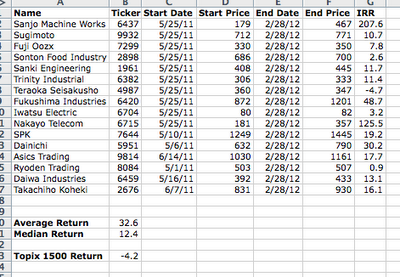 I also included all of the stocks I profiled in my Japanese net-net reports. So first off the results are impressive. An investor would have only lost money on one stock which is pretty remarkable. If someone bought an even amount of each stock they would have had their portfolio return 32.6% against a index return of -4.2%. Let me put this in perspective. Let's take a hypothetical investor who invests $5,000 into each of the stocks presented above. As of May 1st 2011 they would have had $80,000 which was gradually invested into the 16 stock portfolio. As of 2/28/2012 their portfolio would be worth $106,080, a very nice return. US Dollar based investors would have had an extra boost from the Yen appreciation although for my purposes I did everything in Yen so currency movement wasn't a factor in my analysis. An investor could have an even higher return if they would have kept their eye on the stocks throughout the year and sold when certain stocks hit their NCAV. I held Dainichi for a while but sold when the price jumped into the high 900s and low 1000s. The stock has since fallen back to 790 for a 30% gain, but an alert investor could have walked away with much more. I didn't do anything special to get the list above, some of the stocks were net-net's others were trading close to gross cash. Some were profitable, others weren't but overall these were a group of very cheap neglected stocks that the Japanese market left for dead. I'm sure some of you are wondering how did I do personally? I didn't quite do as well as the group average although I did beat the median return; my own set of Japanese net-net's returned 24% since purchasing. I sold off Dainichi when it made it's climb into the low 1000s. My take away from this is that net-net investing works, even in terrible markets when the market return is negative a portfolio of net-net's seems to do well. Every market pundit I've read or heard talks about how Japan is a dead market that investors should avoid. Prudent investors who went in seeking a margin of safety in the form of buying companies for less than liquidation value did very well for themselves. How does a individual investor even invest in Japanese stocks through something like e trade. For E*Trade you can invest in a Japanese stock if it trades on the Tokyo Exchange. Fidelity lets individuals trade on any Japanese exchange including the Osaka exchange where a lot of these net-net's exist. Thank you for you thoughtful blog.... would it be possible to describe how you were able to discover the foreign net-nets. Did you use a "screen" to filter appropriate selections, and, if so, what data source? Thank you again. Sorry for the delay in responding. I have found most of mine through screening. A few have been mentioned to me by readers. Screening is your best bet, you can use Screener.co or FT.com both for free. If you have CapIQ or Bloomberg it's even easier to run a screen. Both your personal and the basket result are fantastic, even more so in the context of 2011. How much do trading costs detract from performance? The Topix is around the same level as it was back in May 2011. Will you continue investing in Japanese net-nets? Why? Why not? Thanks for the comment and questions. Trading costs are important and do play a factor. When I calculated my performance I used the adjusted cost basis which includes the currency transaction fee and my commission. I try to limit my commission and currency costs to 3% or less of my trade total, this is a rule in general. So fees are a real hit to performance, but I don't want to commit enough of money to a few ideas to diminish that impact either. I'd rather have a larger amount of smaller positions especially for Japanese net-net's than be concentrated. At the aggregate level I've been satisfied. As for continuing investment I'm still looking over there! I just posted yesterday about another company I picked up KSK Co Ltd. I will probably keep browsing for the next few months building out a list of companies I want to evaluate after they all release their earnings numbers at the end of May. The firm I work at has been buying Net Nets around the world (though mainly in Japan) for the last few years and the portfolio has a nice return vs. the market. We are lucky though and have a worldwide screen setup via Thompson Reuters so we have lots of possibilities in investigate. Also since we have access to institutional brokers when can trade and not pay excessive commissions. I would think it would be harder to do for an individual investor. Interactive Brokers - you can trade with miniscule commissions on most of the Japanese exchanges.